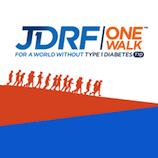 If you are interested in participating in the JDRF One Walk, please click here to register online in advance. Visit the 2018 Boca Raton JDRF One Walk website for a list of individual and team participants, current fundraising progress, or to make a donation. JDRF One Walk has one main goal: to create a world without Type 1 Diabetes (T1D). Join the rest of the community on April 14, 2018 at the JDRF One Walk to help make a cure a reality! If you have any additional questions about the event please contact Esther Swann at eswann@jdrf.org or by calling (561) 801-7273.